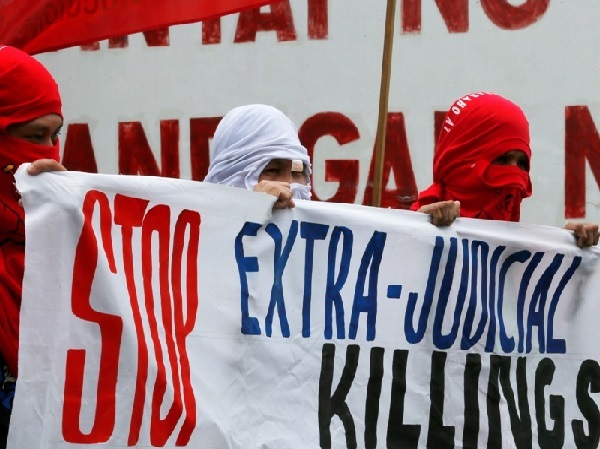 MANILA, Philippines — Washington on Thursday urged Manila anew to comply with human rights commitments amid the rising number of extrajudicial killings and deaths in drug-related police operations. US Department of State spokesperson Elizabeth Trudeau said the US has made its concerns known to the Philippines as it pursues rule of law and due process. "We believe in universal human rights. And we believe that these support long-term security, which is the goal not only for the United States, but also for the Philippines," she said at a press briefing in Washington, according to a transcript released by the State department. "We strongly urge the Philippines to ensure its law enforcement efforts comply with human rights obligations," Trudeau added. Duterte went out swinging against the US in the last two weeks in the wake of its expression of concern on the number of killings related to drugs, which passed the 1,500 mark. Trudeau, meanwhile, did not directly address a journalist's question on whether the Washington thinks Duterte is not taking its statements seriously. "In terms of the exact comments of the president, I'm going refer you back to the government of the Philippines to better understand perhaps what President Duterte (meant)," Trudeau said. "It's hard for me to characterize how seriously they take that. We continue to raise it. We think that our relationship, which has spanned 70 years, is a frank and open enough relationship that we can have those conversations," she added. The president had also slammed the UN special rapporteurs who raised concern over deaths related to the drug war in the Philippines.